One of the hottest diet topics over the last few years has been the Mediterranean Diet. 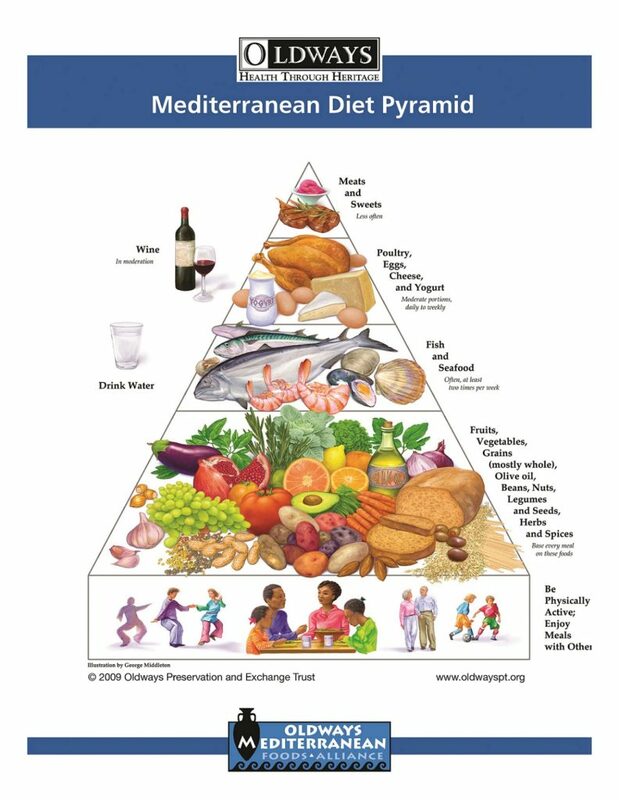 In fact, May has been designated as International Mediterranean Diet Month! Fortunately, this is one of the few diet trends actually supported by science. The Mediterranean Diet is not really a “diet” but a way of living, long enjoyed by people living in countries near the Mediterranean Sea. What is a Mediterranean Lifestyle? Characteristics of this lifestyle include eating a lot of fresh fruits and vegetables, whole grains, beans, nuts, seeds, fermented dairy products, fish, eggs and poultry. In addition, the Mediterranean way of living strives to create a balance of work, relaxation and exercise. The focus of this post is on healthy foods and exercise as part of the Mediterranean lifestyle. Heart disease, stroke, obesity, Type 2 diabetes and other chronic diseases are shown to be greatly reduced by following this lifestyle. Which Foods are on the Mediterranean Diet? Fruits & Vegetables: The less cooked and processed, the healthier. Many of the vitamins and minerals are conserved when the produce is washed, cut and eaten all at one time. Bread: Unprocessed bread is the healthiest. You can buy bread with no preservatives or unnecessary added ingredients. Making your own bread may be intimidating, but it is much healthier and it tastes better! Try Mediterranean Black Olive Bread or No Need to Knead Garlic Bread. Whole Grains, Cereals, Pasta: Again, the less processed a food, the better. You can add olive oil and fresh or steamed vegetables to make a delicious dish. Extra Virgin Olive Oil: This is the preferred fat and is one of the healthiest to enjoy. Cheese, Yogurt & Milk: Greek and plain yogurt are good choices. Serve with fresh fruit for a sweet treat after a meal. Small portions of natural cheeses are enjoyed with fresh fruit, vegetables and a few nuts for a small meal. Milk is included but only in small amounts. Walnuts, Seeds, Olives: Provide healthy fats and offer variety to a meal. Toasted walnuts are a good addition to a pasta dish or green salad. Poultry/Fish/Eggs: One or two servings of poultry, a couple portions of fish and 2 or more eggs per week provide protein and variety to the meals. Legumes (beans, lentils, peas): Another great source of protein and fiber. Meats (beef, lamb, pork): Red meat is considered an occasional treat and a very small portion is enjoyed with fresh vegetables and fruit. Desserts: Cookies, cakes, candy are eaten about as often as red meat. Just one or two times a week, for special occasions. For a wealth of healthy eating information visit oldwayspt.org. What About the Kidney Diet? You are probably wondering why I’m writing about a diet or lifestyle that encourages you to eat foods that are not always acceptable on the basic kidney diet. It may take a little effort, but it is relatively easy for someone on dialysis to follow this diet with just a few adjustments. Phosphorus: The most difficult phosphorus to avoid with the typical American diet is the phosphorus in processed foods. Less phosphorus is absorbed from foods with naturally occurring phosphorus. Therefore it is less likely to cause spikes in your phosphorus levels. Making your own bread and baked goods greatly reduces the phosphorus laden preservatives that allow for a long shelf-life. These few changes may allow you to include small portions of nuts, beans, cheese and yogurt and still keep phosphorus levels in control. Protein: It is important for most dialysis patients to consume a minimum of 60 grams protein and some up to 100 grams protein per day. It will take some planning to ensure enough is eaten, but you can do it. Remember, the decreased intake of processed foods allows for an increase in nuts, beans and lentils and low-fat dairy, which all provide protein. Potassium: The main sources of potassium are fruits and vegetables. It will be important to monitor your blood level of potassium and increase or decrease your intake of high potassium fruits and vegetables. How much potassium to eat is based on your lab results and stage of kidney disease. People in earlier stages of chronic kidney disease (CKD) often do not require a low potassium diet. It won’t take long to figure out the foods you can eat every day versus a few times per week. Water: The recommendation for following the Mediterranean lifestyle is to drink a minimum of 6 to 8 glasses of water per day. This is too much for most dialysis patients who must limit fluid intake to 32 ounces (four 1-cup glasses) per day. Alcohol: Although the Mediterranean Diet suggests wine in moderation, check with your doctor to determine if it is safe for you to consume alcohol and how much is acceptable with your diet. Most nephrologists encourage their patients to avoid alcohol. Part of what makes this lifestyle so appealing is the way the food is enjoyed. Most meals, in this part of the world, are eaten slowly and enjoyed with family and friends. It is very different from our way of living where many meals are eaten in front of the television or while driving from one place to another! Try to slow down and enjoy the flavors and textures of the food. Here is a tasty Green Pesto Pasta recipe featuring fresh basil and garlic to get you started. I am not talking about exercise like the kind you get when you go to the gym or walk a track for 45 minutes. I’m talking about just moving around. Walk to the store, or around the block, ride a bike to see a friend or just to enjoy the park. Think about ways you can increase small amounts of movement so that you feel less stiff or sore. The benefit of the Mediterranean Lifestyle is a result of the healthy foods, increased movement, stress management and relaxation. If you are interested in giving it a try, do a little research about the lifestyle and talk to your clinic dietitian about the changes you want to make to your diet. It will take some effort, but if it helps you feel better, feel more relaxed and enjoy your life, it’s worth the work! Are you ready to get started? Talk to your dietitian and try these DaVita dietitian approved Heart Healthy Mediterranean Recipes. Stage 3 kidney disease, plus atrial fib. Thank you for the great feedback Gloria. Here is a link to that post to “What is a Kidney-Friendly Diet” for anyone interested in reading it. Some kidney friendly diets warn of tomatoes and all whole grains, nuts. etc., high in phosphorus and/or potassium, though they they are a large part of the Mediterranean diet. MOST confusing! What path do I follow, since heart problems are in the mix, as well as low weight — need to gain 20 lbs. There is research showing it may be possible to incorporate more whole grains, nuts, beans, legumes into the renal diet. However, it is very individualized. If you are on dialysis you may speak with your dietitian to see what your blood results are showing as far as your phosphorus and potassium levels. If they are in range, your dietitian can give you information on portion size and how often you can incorporate these foods. Tomatoes are high in potassium, so again, checking your blood results would help with food choices and what you can incorporate into your meals. Is it ok to drink a little Apple Cider vinegar daily ? Like is it ok to put 1 teaspoon in one cup of water and drink that? I heard Apple cider vinegar is good for your health. Joan, Great question and one I get a lot. Apple Cider Vinegar has become popular in the last few years. The problem is that there are very few scientific studies that demonstrate a benefit to adding Apple Cider Vinegar to your diet. The studies that are available are very small and the conclusions cannot be made across a broad range of individuals, especially ones with health related concerns. I found one study that demonstrates and improvement in blood sugars for Type II diabetics when an individual added Apple Cider Vinegar to their diet, but the study included a small group and was over such a short time period that it was impossible to conclude the Apple Cider Vinegar was the reason for improvement. In short, more studies are needed. A concern about Apple Cider Vinegar is that it may damage the enamel on teeth. It would be wise to speak with your dentist before adding it to your diet on a regular basis to ensure your teeth and gums can handle the acidity. Another common complaint, it that Apple Cider Vinegar can cause increased GI discomfort, for someone already suffering from IBD or other GI problems. It is important that anyone with chronic health issues, such as diabetes or CKD, talk with their dietitian or physician before adding supplements to their diet. Eat healthy foods and enjoy your meals! Bob, Thanks for your comment. 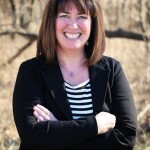 I write these blogs and just hope someone enjoys them. I am trying so hard to follow a kidney friendly diet. Everything I read is about those on dialysis. My stage is 3 b and not on dialysis …yet. My doctors just tell me to go east on the protein about 25-35 g protein daily. I am so confused . My ppps are in good range. My cratinine is 127 and my bun is 38. I know they are high. I never use salt but I do eat chips with low sodium. I don’t seems to get any help from anyone it is very frustrating. I feel bad as I just lost my brother to renal failure in February. I am sorry you are having a hard time with the information you are finding. It is ok to do whole wheat bread if that is what you like, there is research showing it is fine to have with kidney disease. Regular cows milk is going to have more protein than milk alternatives like almond, rice or soy milk. I have been suffering from diabetes for 18 years. Recently my Creatinine level is 1.7 mg/dl. On 26.10.2016 it was 1.97, therefore I am with CKD. My bi-pas surgery performedon 26.12.2002. So I am very allert in my diets which are both CKD Heart friendly. But some time I exprience difficult to choose my diets. Because when whole grain is good for heart but CKD does not allow whole grain. There are contradictions between Heart and Kidney in selecting diets. would you kindly give me a diet plan which are both kidney & heart friendly. I shall be grateful for your kind suggestions. I look forward for your reply thanking you. Great information and very helpful and useful. Sandi, Thank you! It is always nice to know the info I write is useful. What about protein daily allowance for moderate CKD patients not on dialysis? How many grams per day? You’ve asked a great question and I wish the answer was a simple one. The amount of protein a person requires is based on many factors and not something I can answer for you. Your protein requirement depends on your current nutritional status, your usual nutrition intake and lab values. The good news is unless your kidney doctor has told you the amount of protein you should eat each day, you don’t need to make any changes to your current diet. Eat healthy foods you enjoy, including protein. If you still have questions or concerns about your diet at your next appointment, as your doctor to refer you to an outpatient dietitian to help you develop a plan for moving forward. Just the fact that you are so interested, is important to your success. Keep learning. I am stage 4, best breakfast meals , or cereal. The traditional renal diet did cut out a lot of whole grains and replaced those with white bread, white rice, etc. There is new research showing ways to reincorporate these types of foods. Talking with your dietitian and looking at your blood results may help determine if this is appropriate for you. Here are a few articles on whole grains and vegetarian diets for renal patients. is soy protein hard on kidneys in a Bun of 59 and creatinine of 3.070? Thank you for your questions. Here is an article on information about soy products and kidney disease. Can I eat almond s and skimed milk ? Almonds and skim milk are both good sources of potassium and phosphorus. If you doctor is taking regular blood work, check with your doctor or dietitian to see what where your blood levels are for potassium and phosphorus. That will show if you are able to incorporate these particular foods.